Vivid and imaginative digital paintings. Bring characters to life through hand-crafted 2D application. Logos, banners, gifs and more! Contact for a free consultation to discuss your projects. Illustration is cool, mmkay? Paintings, book covers, splash images, character art and more! Whether you would like to spruce up your business website with an explainer video or are working on something personal, have your project come to life with some 2D animated flair. Logos, banners, gifs. Anything you can think of Amber Animation can help you with! From website graphics to twitter avatars, make your web presence unique with custom works of art! Illustrated Moments. Lush paintings that spark the imagination. Book covers, splash images, character art, background paintings. 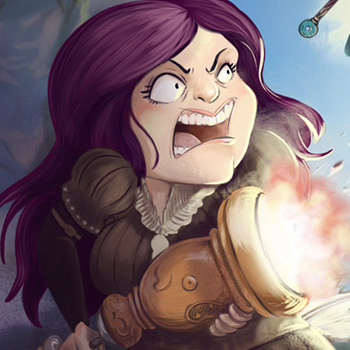 Amber Animation hosts a variety of styles to best help you with your illustration needs. For fun or for work, Amber Animation will work with you on your projects to bring them to life. A portrait gift for mom's birthday or a book cover for your epic sci-fi anthology; we can help! Get movin' and shakin'! Get animated. Grab attention with some slick animation and smooth moves.